The maximum frequency measurement error for primary control is 10 mHz, as specified by the association of transmission system operators (ENTSO-E). The error of the measuring instruments micromax-fgps (Dr. Gobmaier GmbH) used here is below 1 mHz. At a frequency of 50 Hz, this corresponds to an accuracy of 0.002 % or 20 ppm. Faster timed measurement is possible, but with greater noise due to the harmonic waves. Moving average mean values with 100 ms bzw. 150 ms can be measured with an accuracy of ±5 mHz. For mains frequency measurements micromax-f with a temperature compensated oscillator circuit is recommended. The micromax-fgps with GPS has a timebase which is synchronized to UTC. This is useful when the phase should be detected at different locations. The instruments have a resolution of 0.1 mHz and an accuracy of ±1 mHz. For more information you can download the datasheet of the micromax-f and -fgps. The voltage signal is converted into a square wave signal with a Schmitt-Trigger . The hysteresis of the Schmitt trigger is insensitive to voltage fluctuations (eg. network problems, ripple). A frequency counter counts the number of periodes of a reference frequency between two changes of state of the square wave signal. From the number of counted clocks the interval length of the input signal, and the frequency can be calculated. The measured values are averaged within one second (corresponding to 50 periods) and transmitted every second on the server. The exact frequency of the oscillator for frequency counting is subject to natural fluctuations, of which the temperature has the greatest impact. To compensate these fluctuations of the time measurement frequency, the time signal of the GPS system is used as a reference. This reduces the measurement error below 1 mHz. The very low temporal error of the transmitted GPS atomic time with a relative standard deviation of at most 10-12 is much smaller than the other measurement errors and can therefore be neglected. The mains frequency shown on this website and the phase angle are based on a real-time measurement, the indications for positive and negative primary control power are calculated without taking into account the allowable power gradient. The changes in the nominal frequency by ± 10 mHz to correct the grid time is not considered. The mains frequency is recorded by three identical instruments in two places since July 1, 2011. So the recording can be continued even when there is a failure of a device or power failure in one location. 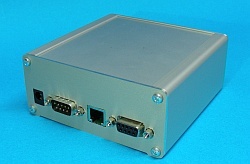 The connection to the web server is set up by two devices. If there is an error on the web-connection, the display of the data is not updated until the fault is corrected. For more information about the system you can read the article ELEKTRONIKPRAXIS "Messung der Netzfrequenz".